At the beginning of November at the annual Allotment prize giving at the Town Hall, Derek Lawrence-Brown and John Padgett received the London in Bloom Allotment Award on behalf of the Hertford Avenue plot holders. It came as a complete surprise, although we obviously knew that Derek had shown the London in Bloom judges around the allotments back in July. 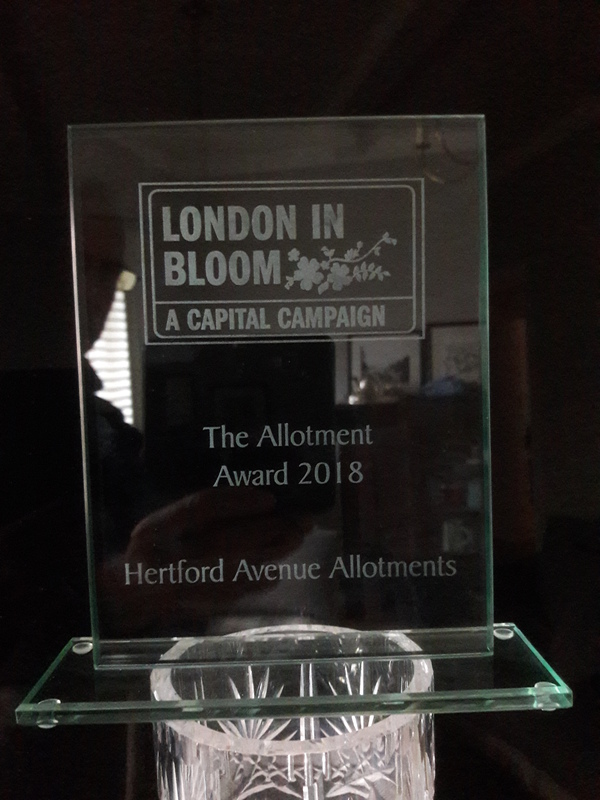 We were judged to have the best kept and well-cultivated Allotments out of all the London Boroughs and the award was presented by the Mayor of Richmond upon Thames. This large allotment site is clearly well used. Judges met the allotment site rep and heard about its activities that included three organised community events each year. Engagement appeared to be thriving and a broad range of produce was in cultivation. The site is well organised and maintained and green waste either removed or composted as appropriate. A regime of using wood chip in certain areas of the site as a mulch is in place.